The Alhambra palace, Granada - Andalusia, Spain. 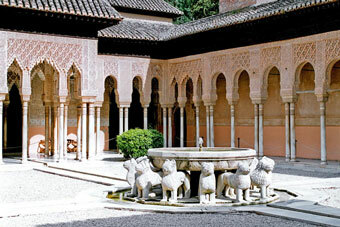 The Alhambra, Generalife and Albaycín quarter of Granada were declared as World Heritage by UNESCO in 1984. The Alhambra was a palace, a citadel, fortress, and the home of the Nasrid sultans, high government officials, servants of the court and elite soldiers (from the 13th to the 14th century). Today, the monument is divided into four main areas: the Palaces, the military zone or Alcazaba, the city or Medina and the agricultural estate of the Generalife. All of these areas are surrounded by woods, gardens and orchards. 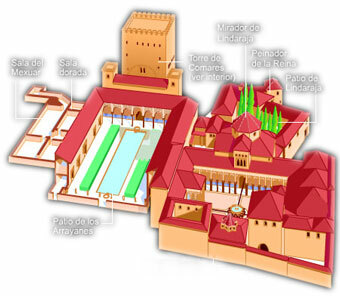 Carlos V PalaceOther notable buildings belonging to a different time period are also included, such as the Renaissance style Palace of Charles V, which houses the Alhambra Museum (most of the items are from the site of the monument) and the Fine Art Museum. In order to fully appreciate the unique architecture of the Alhambra set within the surrounding landscape, it is advisable to visit an area of the Albaycín called the Mirador de San Nicolás, or go to Sacromonte. From both of these places the Alhambra's spectacular location, lying just above the city of Granada, can really be admired. Find your hotel Granada city now! Arab text in the Alhambra, Granada. Though the origins of both important monuments of Granada, the Alhambra and Generalife, are not clear, there are certain remains from the 9th century, the Alhambra’s most brilliant creations date from the Nasrid Empire and the reign of Carlos V, between the 13th and 16th centuries. In its palaces, from the window of the mirador de Daraxa to the mottled stone columns of the Carlos V palace, everything in this complex is designed, planned and executed with only the thought of perfection in mind. This perfection may approach that of the Koran or Sunna or find itself closer to the Neo-Platonism of the Renaissance. 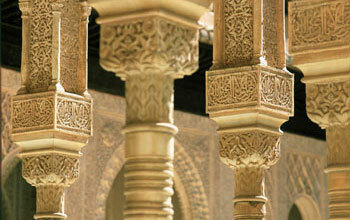 Information about Alhambra and Generalife. Guides to Alhambra and Generalife. Buy and reserve your tickets. Photos of the province of Granada - Andalusia, Spain.